This is a great little salad. It’s light and refreshing, and just looks pretty as hell. It works really well with roasted corn, although this recipe uses boiled corn. 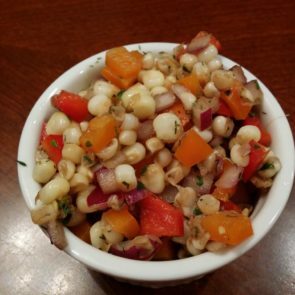 Using roasted corn changes the flavor of the salad a bit, and works well with additional spices. This beautifully colored dish makes a great side dish for a barbeque or light summer dinner. Buying corn from the grocery store like this instead of still completely in the husk means no surprises waiting beneath! The corn to onion ratio should provide good crunch an flavor, but the onion shouldn’t overwhelm the dish.